Karen Swan, author of Christmas Under The Stars and Christmas on Primrose Hill, shares her favourite places to spend Christmas. The whole reason I had this fireplace put in was to ensure Father Christmas could get down it! I want my children’s Christmas memories to be of waking up in their own beds and knowing their stockings are bulging with presents by this fire. I’m all about cosiness and hunkering under blankets together and for me, a huge roaring fire is an essential element for Christmas Day and every bit as important as the turkey. Two years ago, we enjoyed a big family Christmas at this chalet near Verbier and if I thought I could have got away with changing the locks and staying there forever, I would have done it. The views over the Rhone Valley were sensational, especially when viewed from the comfort of a reindeer-blanketed chair with a glass of vin chaud to warm my hands. Almost all my childhood Christmases were spent in the Scottish Highlands, where my father’s from, and we still own a lovely, very tiny crofter’s cottage just outside Glen Coe. I know all the walks up there and I don’t care how bad the weather gets, I insist on a yomp down by the river. It’s the only way to justify spending the rest of the day on the sofa. If I couldn’t spend Christmas out in the wilds, then I’d want to be in the very heart of London and go all the way on the urban festive thing. A big Mayfair hotel, Claridges has the pedigree and experience for doing Christmas properly. I bet the presents in the crackers would be amazing and I’d take a misty morning walk in Hyde Park, smiling at strangers and wishing them a merry Christmas. A good friend took a group of us to a small chateau in Bordeaux for his 40th and I’d love to go back there one year for a big family Christmas. The rooms were painted in dark matte colours with sensational original floors and fireplaces, and stone walls six feet deep. It has an incredible spa, beautiful garden, a wine cellar that you’d pay to be locked in overnight and the chef was an artist, bringing out pulled pork garnished with stems of lavender and potatoes grown just outside the windows. 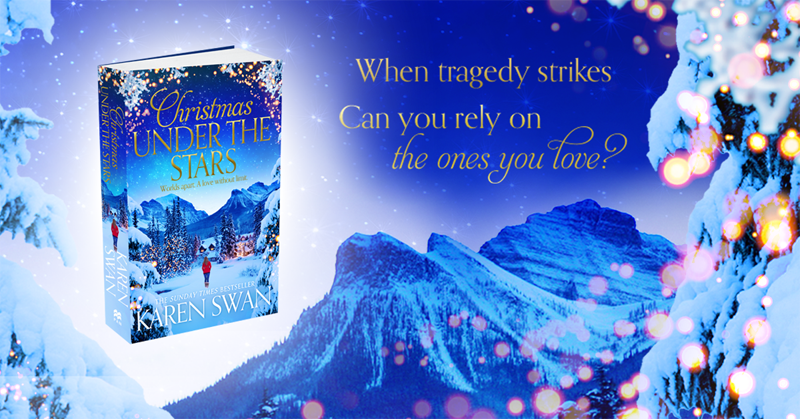 Christmas Under The Stars, the gripping new festive novel from Karen Swan, is out now.